The H72A series has been discontinued. Please contact our Flow Engineering department. 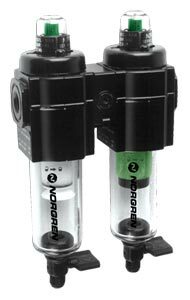 The H72A Series Compressed Air Filter-Filter Combination Units are designed for use as a single in-line unit or as part of Norgren's Excelon® modular compressed air preparation supply system. As a modular component, this filter-filter can quickly be attached to regulators, smooth start / exhaust valves, safety lockout valves and pipe adapters. With our Quickclamp® and Quickclamp® and wall bracket accessories, a complete compressed air supply system can be assembled and mounted in minutes. The H72A series partical and coalescing filter combination units provide efficient oil removal and partical removal down to 0.01 µm. Filtration of compressed air is extremely important for operation of pneumatic components and air line tools. 참고: Models include PTF threads, service indicator, automatic drain and long transparent bowl without guard on both filters. Excelon® Lockout Safety Valves for Compressed Air Systems.